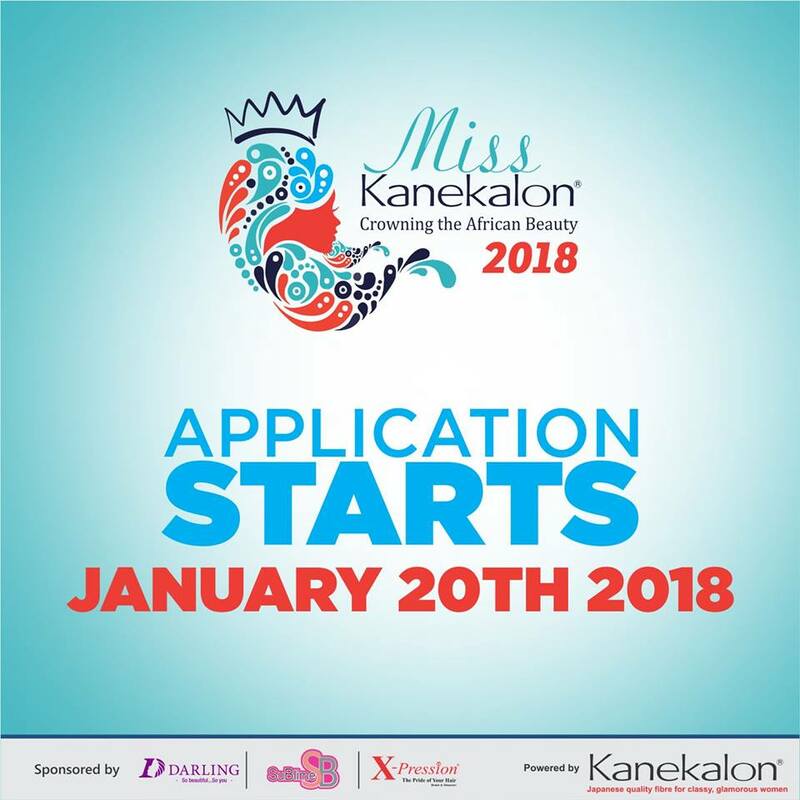 Miss Kanekalon 2018 application is Open. 4. After Submission you will receive a congratulatory message. You can verify your application status by clicking on Check Application Status on your congratulatory message. Visit www.facebook.com/kanekalonafricapage for more details. Applicant must be a natural and single African female between the ages of 18-25 years old (as at 14th July, 2018) residing in Nigeria or Ghana. Applicant must be a user of KANEKALON hair extensions. Applicant must have high morals and a charming and proactive personality. Applicant must team up with a stylist and this stylist is also required to attend the FINALE on 14th, July, 2018 in Lagos, if the applicant is selected as part of the 20 FINALISTS. Applicant's stylist must have or belong to a salon. Upon being chosen as the winner of Miss Kanekalon 2018 or Runner up, applicant must commit to carrying out all the duties that accompany the role for the stipulated time required. Based on ethical requirements for winners, contestants with health challenges, tattoos, birth marks, scars or criminal records (Which also applies to the applicant's family) are not eligible for the competition. Submitting this application, automatically states that the applicant agrees to these terms. Kanekalon reserves all rights to the usage of all images and videos sent in or taken during Miss Kanekalon 2018. Applicant must provide a genuine birth certificate or affidavit signed by a notary public. 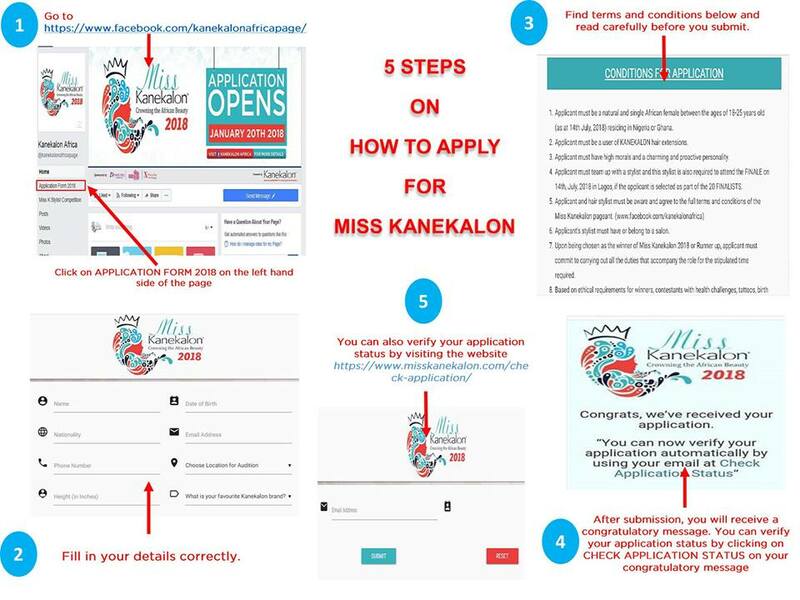 Please log on to www.facebook.com/kanekalonafricapage page for full terms and conditions for application. Sending this application will automatically mean the applicant has read and agrees to the full Terms and Conditions for the application. Final (Lagos) July 14th, 2018 Lagos, Nigeria. Competition Ends on 14th July, 2018.